Have you just put the wrong fuel into your vehicle? Have you just mistaken put petrol for diesel or diesel for petrol? If you have, our highly trained wrong fuel engineers can help. We cover all areas in the United Kingdom e.g. London, Essex, Manchester Liverpool and Kent. Our team drains wrongly filled petrol or diesel from your fuel tank and takes the necessary measures to get your vehicle working again. It doesn’t matter if you’ve just added the wrong type of fuel at a petrol station or if you’ve driven your car with the fuel in the tank. Whatever the problem may be, our engineers will have you on your way in the shortest possible time.There’s no need to be embarrassed if you’ve put the wrong type of fuel in your tank. An astonishing 150,000 UK motorists make the same mistake every year; that’s one case of somebody putting petrol in a diesel car or diesel into a petrol car every four minutes! We provide fast fuel drainage services for customers who make this simple yet highly inconvenient mistake. Call our offices, let us know where you are and tell us your vehicle information. We’ll arrange for one of our engineers to meet you and inform you on how long their arrival will take. 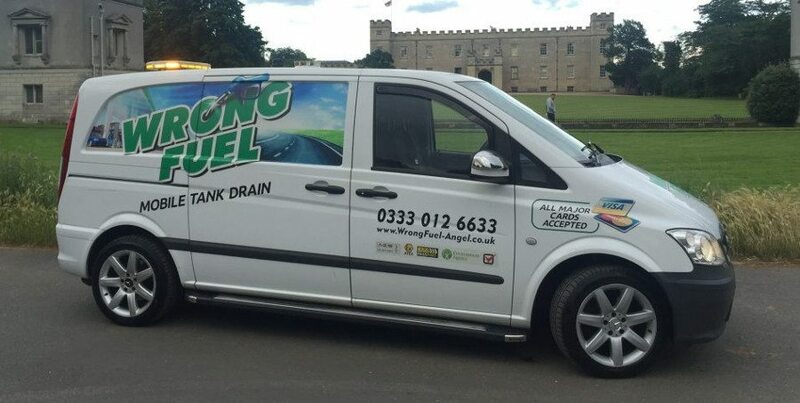 Our highly regarded experts deliver a responsive service that drains the wrong fuel from your tank at any location in our London, Essex or Kent trading areas.